Shares in advertising group WPP fell by more than 10% this morning after it reported slowing sales and cut its forecast for the year. The stock was at one point down by over 13% after it posted revenues of £7.4bn for the six months to the end of June - up from £6.5bn - but a 0.5% dip on net like-for-like sales, the latter a key metric relating to underlying growth. If continued, the loss would be the company's sharpest one-day drop in almost 20 years. 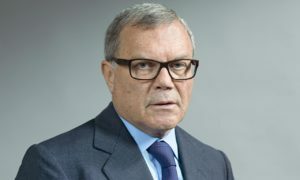 Founder Sir Martin Sorrell had started the year by forecasting that the advertising giant would see growth of 3%, but cut this in March to 2% to reflect “tepid” economic growth. And the company today downgraded that even further. In a statement, it said: "Following the pressure on client spending in the second quarter, particularly in the fast-moving consumer goods (FMCG) or packaged goods sector, the full year revised forecast has been revised down further, with both like-for-like revenue and net sales forecast to be between zero and 1.0% growth." Chief executive Sorrell said that in the past year, growth had become "even more difficult to find". “For the short-term, we have to weather the storm," he added. WPP has several operations based in the North including MediaCom’s media agency stablemate MEC, creative agency Cheetham Bell, studio and post production company Farm North and research company Kantar.